1884 September 1st. Born in Srinagar, Kashmir in British India, one of three children of a military family. His father, Edward Henry Maunsell (1837-1913) was of Anglo-Irish descent, and was a captain in the 5th Dragoon Guards and 15th Hussars. His mother, Rosalie Harriet Anson (1852-1922), was born in Guernsey; the couple had married in Bombay Cathedral in 1878. He was distantly related to General Sir Frederick Richard Maunsell (1828-1916) of the Royal Bengal Engineers. Studied civil engineering at the Central Institution of the City and Guilds of London Institute, South Kensington. Although he graduated with First Class Honours in 1906, he didn't find immediate employment and travelled the country making watercolour paintings. The following year, he became an assistant to Swiss engineer Adrien Palaz (1863-1930), professor of Industrial Electricity at the University of Lausanne, where he learned the latest techniques associated with reinforced concrete. 1909 Joined Easton Gibb and Son who were engaged in the construction of the Rosyth Dockyard. In July 1914, Maunsell moved to R. Thorburn and Sons as their chief agent and was responsible for building two TNT factories for the British Government. In 1917, Maunsell was conscripted as a commissioned officer in the Royal Engineers and spent a year on the Western Front. Recalled to England, he worked as chief engineer at John Ver Mehr's yard in Shoreham, in the construction of concrete tugs and barges called the Shoreham Creteships. He was also involved in the concrete and steel towers for the Admiralty M-N Scheme, which were intended to close the Strait of Dover to U-boats. A single tower survived today as the Nab Tower lighthouse. 1955 Founded the firm of G. Maunsell and Partners which pioneered the use of prestressed concrete in major bridges. The Hammersmith Flyover, completed in 1961, made revolutionary use of this new construction method and many more structures followed. The firm expanded to Australia, Hong Kong and the Middle East and in time became part of the US-based AECOM Group. Maunsell is best known for his innovative, practical maritime engineering and pioneering the development of prestressed concrete in the UK, Australia and Hong Kong. His view was always that the interests of a client would be best served by an integrated approach to design and construction. 1961 June 20th. Died in Ireland. ONE of the most imaginative of British civil engineers, Mr. G. A. Maunsell, died on June 20, at the age of 76: many original structures can be cited as examples of his inventiveness. Guy Anson Maunsell was educated at Eastbourne, Inverness, and the Central Technical College (now the City and Guilds College). After early training on hydro-electric construction in Switzerland he worked for Easton Gibb and Son on the construction of the Rosyth naval base. While still in his late twenties he was appointed chief sub-agent and in immediate charge of the main labour force. Forty years later he himself said of this job : " I have never elsewhere encountered anything to compare with the desperate character of the engineering struggle which took place." During the war of 1914-18 he was chief agent on the construction of explosive factories at Misk and Pembrey and then went for two years on active service in France as a Royal Engineer officer. He was recalled to this country in 1918 to work on the design and construction of concrete ships and "Mystery" towers. 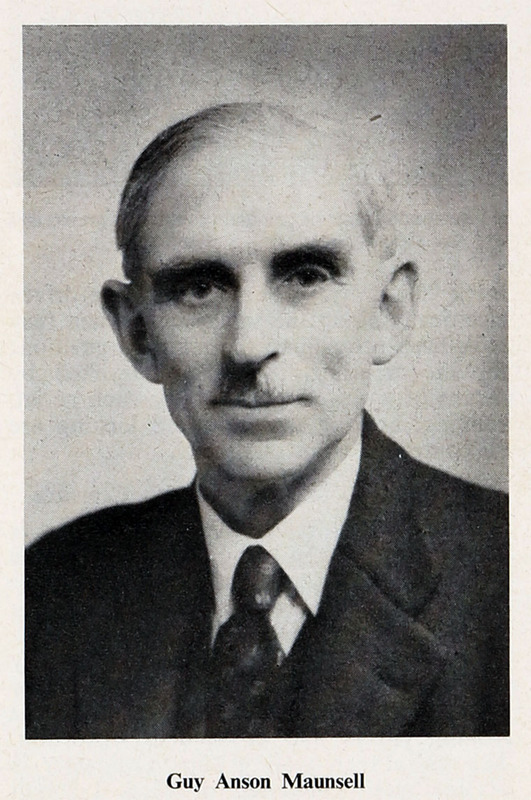 After the war he served in the Ministry of Transport under Sir Alexander Gibb, then the first chief engineer, and while there was associated with the preparation of a scheme for the generation of tidal power in the Severn estuary incorporating a barrage at English Stones and provision for pumped storage. In 1931 he joined Dorman, Long and Co., Ltd., as agent on the widening of Putney Bridge, on the completion of which in 1933, he was appointed Managing Director of the Anglo-Danish Construction Company formed to build the Storstrom Bridge in Denmark. It was here that his long experience of marine work came to full fruition. He devised a scheme for pier construction which incorporated a unique floating cofferdam and worked with great success, and a floating crane, cheaply constructed out of readily available materials and equipment, which erected the steel superstructure of the approaches a span at a time in complete prefabricated units weighing up to 500 tons. In 1936 he commenced practice as a consulting engineer in Westminster which he continued until he retired in 1959. His first major opportunity as a consulting engineer came when Sir Alexander Gibb invited his collaboration on the reconstruction of Telford's famous Menai Bridge. During the last war he designed the Maunsell sea forts which were of two types— anti-aircraft forts, six groups of which were commissioned in the Thames and Mersey estuaries, and naval forts, four of which were placed in the approaches to the Thames Estuary. In these latter forts the twin fighting towers were carried on an integral concrete hull on which the whole assembly was towed and sunk into position. The forts were fully manned and armed during these operations; one of them was in action within thirty minutes of final placing on the seabed. Another war-time project was the design and construction of twenty-five reinforced concrete floating docks of lifting capacities up to 1000 tons. In these Maunsell made extensive use of precast concrete members, and his feat in designing and planning to produce one complete dock every four weeks from a single construction yard by this method pointed the way to the present stage of development where this form of construction is widely used throughout civil engineering work. In 1951-52 he was responsible for the reconstruction of Barry Commercial Graving Dock, in the course of which he designed two particularly interesting and economic caisson gates of composite steel and concrete construction. In 1955 he conceived a novel method of crossing the Firth of Forth by means of a submerged concrete tube supported on large circular piles. This idea was fully described in THE ENGINEER of February 15, 1957. In 1952 he examined the floating concrete bridge at Hobart at the request of the Government of Tasmania, and recommended serious consideration of a high level bridge as a replacement. He later initiated the design of this structure. In 1956 he reported on the then proposed Narrows Bridge at Perth for the Government of Western Australia, and was responsible for the introduction in the work of large hollow steel piles ("Gambia" piles) driven by a hammer working internally, a successful development of ideas he had first used in the design of a wharf in the Gambia. His last major work was the design of the 1000ft span concrete arch bridge, now under construction at Gladesville, Sydney, New South Wales. This page was last edited on 21 May 2016, at 17:28.